Give your warm weather wardrobe the royal treatment with some lovely and luxurious prints. In this collection of designer fabrics, you'll find wonderful possibilities for stylish, eye-catching and comfortable wear. 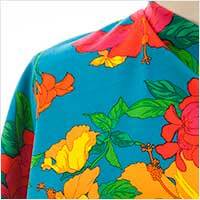 There are cottons and silk blends in bright, bold, colors; fabrics to be used on their own or mixed together. These fabrics can work beautifully in a variety of styles from dresses to bow tops to sarong-type skirts to floaty pants.